NEW YORK -- Boston Celtics guard Keith Bogans still is friendly with many players on the Brooklyn Nets. He often trades text messages with Deron Williams, Joe Johnson and Andray Blatche, and is well aware of the team's early struggles. A wry smile forms when he's asked about the fact that Boston's "rebuilding" team currently sits atop the Atlantic Division with a three-game lead over the so-called dream team that he was traded from. "Whoever would have thought when the trade went through that Brooklyn would have the record they have, and Boston would have the record that we have right now?" Bogans asked. A photo op led to a viral moment. 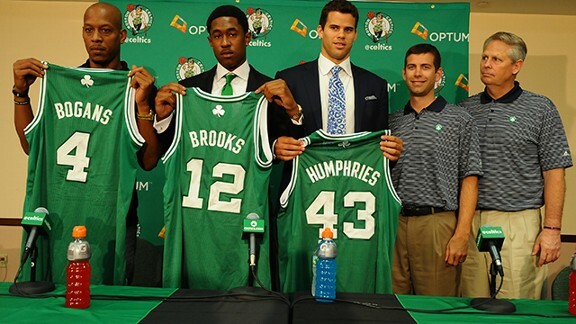 The three new Celtics looked forlorn holding up their new jerseys next to first-year coach Brad Stevens and president of basketball operations Danny Ainge. Stevens is the only one smiling. Bogans has only fond memories from his time in Brooklyn, where he got a chance to jump-start his career again after a broken ankle wiped out much of his 2011-12 campaign with the team. The trade earned him a hefty pay increase and the fact that Boston has a better record only sweetens things. Asked if he needles any of his former teammates about their rough start, he smiled again. "Reggie [Evans]," Bogans said. "I've got to let Reggie have it." When the Nets visited Boston for the teams' preseason finale in October, Evans found a couple of lemons in the visiting locker room at TD Garden. He grabbed a marker and had teammates autograph them before having a ball boy deliver them across the hall to Bogans and Brooks. The insinuation: Life handed them lemons, so enjoy the sour taste of losing. "[Evans sent] me lemons and text messages, telling me how they're going to whup our [butts] when we come to Brooklyn," Bogans said. Then he shook his head and smiled again. These Celtics have made lemonade. Winners of six of their past eight, the Celtics will enter Tuesday's game with a 10-12 mark and, by virtue of leading the division, stand as the fourth seed in the Eastern Conference. The Nets are 6-14 and were tied for 12th place in the East entering Monday's action. Members of the Celtics did their best to downplay the first regular-season matchup between the tangled teams. Coach Brad Stevens said he hoped his players got some of the emotions out of their system during two preseason meetings (though Garnett did not participate in either game). Both Jeff Green and Jared Sullinger dismissed the emotional aspect of the game, suggesting the focus is simply on playing a division rival. But Bogans knows that some of Boston's players will be extra hyped when they see Garnett across the floor in the Nets' black-and-white uniform. He doesn't think that's a bad thing. "I think they are going to take the challenge," Bogans said. "I kind of stay on them about it. Try to keep them hyped up, keep them ready to go. I think they are going to take the challenge and go at these guys. "I tell them, 'We're friends before tipoff, but for 48 minutes we're not friends.' Shake hands after the game and chat it up, but during the game we're not friends." Sullinger and Green are embracing that mindset. Sullinger gushed about what Pierce and Garnett meant for his development as a rookie, but noted they don't wear green anymore. "Those are great guys over there, they taught me a lot," Sullinger said. "But at the same time, once that horn blows and the ball goes up, we're enemies." Echoed Green, "I enjoyed the time I had with [Garnett], but he's an enemy now and he'd say the same thing. We're both trying to win the game and I'm trying to do the best I can to help my team be the victor." The Celtics would have additional motivation if Brooklyn's pick was coming to them this season. Instead, Atlanta has the option to swap first-round picks with the Nets based on the trade for Johnson. Boston will get Brooklyn's 2016 and 2018 first-round picks (with an ability to swap spots in 2017). That's when the Celtics will really be rooting against the Nets in hopes of accelerating their own transition process. But maybe they already have done that. They'll have a chance to prove it on Tuesday.